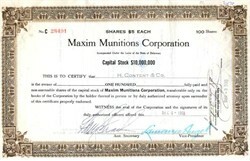 Beautifully engraved certificate from the Maxim Munitions Corporation issued no later than 1919. This historic document has an ornate border around it. This item is hand signed by the Company's Vice-President and Assistant Secretary and is over 99 years old. Germany was one of the first nations to recognized the importance of the machine gun on the modern battlefield. At the outbreak of the war in August of 1914, it was estimated there were 4,918 heavy guns of all types (1901, 1908, 1909) in German service. By July 1916 the guns deployed (including captured MG's) had risen to 11,000. By January of 1918 the estimated strength was 32,000. All of the '08 MG production was at the Government arsenal at Spandau and at the works of DWM (Deutsche Waffen und Munitions Fabriken) in Berlin. How many were produced at each is somewhat foggy since there are blocks of serial numbers that were skipped over. The closest guess (*) is that Spandau built most of the pre war guns and around 10 thousand MG '08s in 1917 alone. Spandau then ceased '08 production so it could devote its resources exclusively to the production of MG08/15 and LMG08/15 patterns.. The mount for the 1908 Maxim was known as the '08 sled. It was quite heavy yet it provided an extremely stable platform for the gun's operation. It was capable of both a high as well as a low mounting. It was quick to fold and carry and provide a very accurate shooting platform. It provided capability for elevation and traversing as well as provided compartments for various spare parts and tools. It was called a sled because it had the capability of being dragged to forward exposed positions, the front being curved like the front of a snow sled and the folded legs acting like runners. Unlike the opponents, the German army fully recognized the potential of the machine gun and its use on the battlefield. Not only had they developed tactics but they also carefully selected and trained the crews to operate the guns. When Germany entered the war in 1914 each infantry regiment had three machine gun companies of hand pick troops, thoroughly trained in the operation of the sled mounted '08 Maxim. Each company had six guns crewed by 1 Company commander, 3 2nd Lts. and 133 other personnel (including support personnel). By 1917 the number of guns per company had risen to 12. Tactics had also been under going changes. Instead of guns defending only the areas directly in their front a series of positions and interlocking fire zones provided a virtual wall of fire in their combined front. The middle two guns fired forward, the guns on the left and right flanks provided enfilading fire. The pattern in the diagrams is reminiscent of a thatched roof, the effect was deadly. History from Air Ground Museum at Quantico, Virginia.